If there is one thing Bella is insistent on it is having stuffies when she goes to bed. Sometimes I wonder how she sleeps with the mountain of stuffies in her bed. She is getting to that age where the complete dark is in her words “scary mommy”. We have been using a little night-light in her room however, she shares a room with her 11-year-old sister Hailee and the light bothers her. So we needed to find something that would help Bella not be scared but also not keep her sister awake. 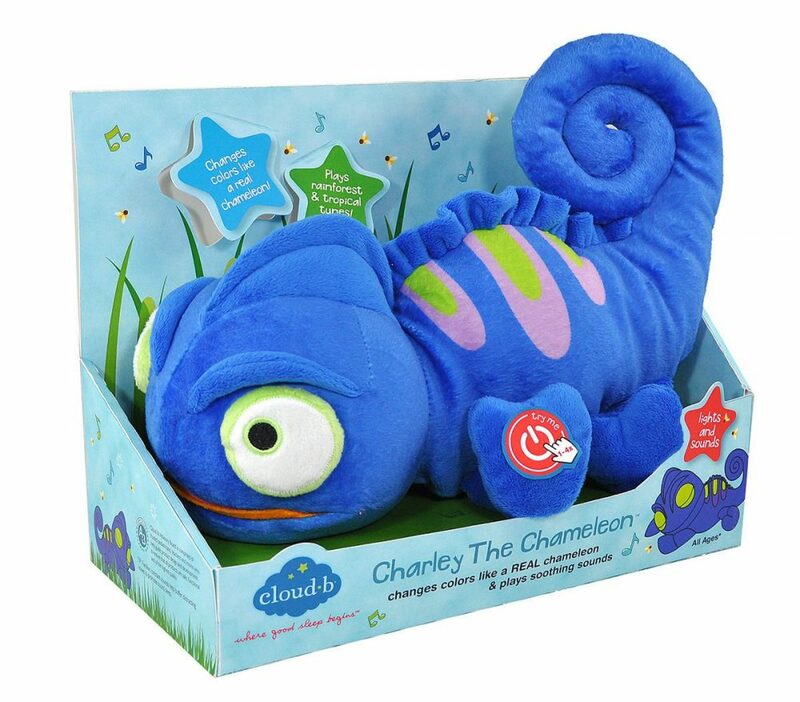 We recently were sent the adorable Charley the Chameleon from Cloud b to review with Bella and it honestly was the answer we were looking for. He is a super soft premium plush cuddly companion that helps children transition from play time to sleep time. He has scales that light up to ease that fear of the dark many children like Bella have. It also has soothing sounds that help make them feel safer at night. I will admit I was worried we wouldn’t be able to squeeze Bella’s new friend in with all her other stuffies. To my surprise she gladly allowed us to remove almost half of her stuffies and put them on the shelf near her crib. Charley the Chameleon is her new fave bedtime pal! Actually, she insists he come out with her in the morning when she wakes up and sits him beside her as she eats breakfast. Throughout the day I often catch her snuggling up and chatting with him. The imagination children have is so beautiful! Charley the Chameleon has three LED light options to choose from; amber, blue, and green. He is a super cuddly plush body pillow that is the perfect companion for kids that are transitioning from a crib to their own big bed. This is something we will be doing in the very near future with Bella and it makes me feel a bit better that Charley will be there to help with the transition! Charley also has 2 soothing sound options; Rain Forest and Tropical Tunes. It is hard to say which is Bella’s favourite soothing sound because both get equal play time. He also has a 45-minute sleep timer which is the perfect amount of time to allow her to fall asleep before he turns off. 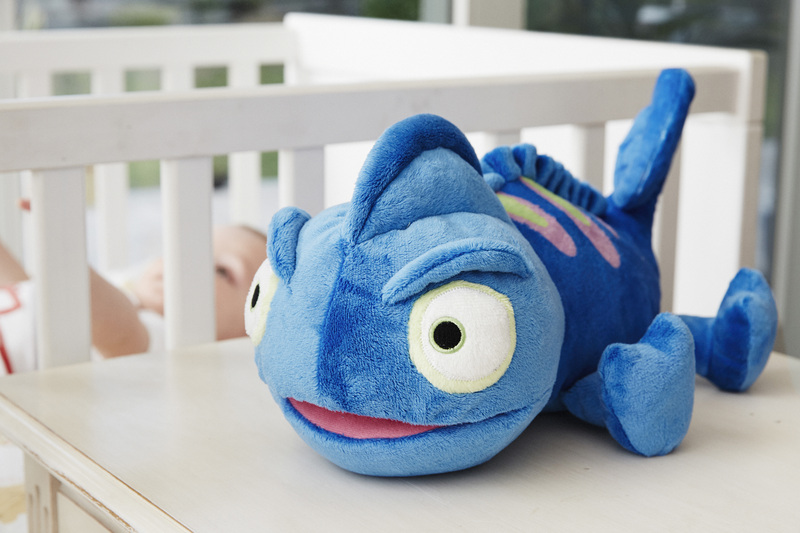 Charley is rated for ages 0+ so he would make the perfect baby shower gift that will be loved for years to come! You can find Charley the Chameleon online at Walmart. For updates and more be sure to follow Cloud b on Instagram, Facebook, Twitter, Pinterest and YouTube! 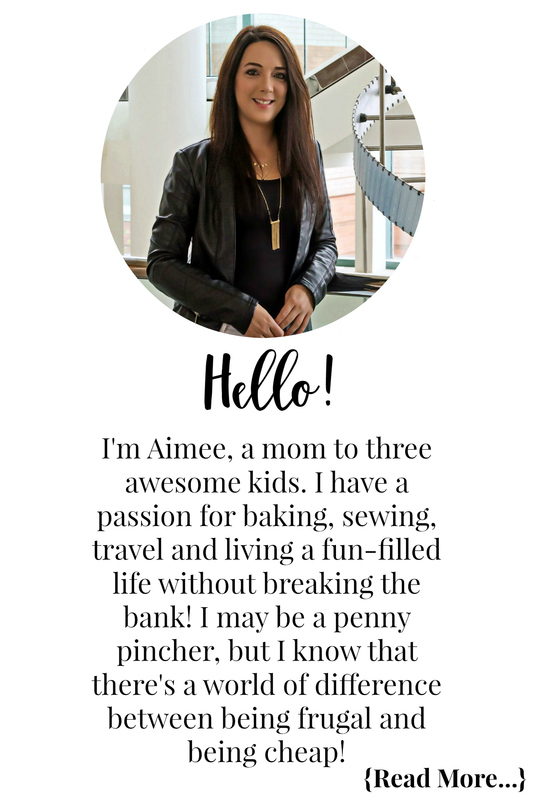 This giveaway is open to Canadian residents who have reached the age of majority in their province. To enter the giveaway complete the mandatory entry options in the giveaway widget below. Once you have completed your mandatory entries you will be able to complete additional non-mandatory entry options. Complete those for additional ballots in the giveaway! This giveaway will close on December 19, 2016 at 11:59 PM EST. The winner will be drawn from all eligible entries and contacted via email on December 20, 2016. The winner will have 48 hours to respond to the email and claim their prize. If they fail to do so a new winner will be drawn. Disclosure: Although we were sent product for review consideration, the opinions and language are all my own, and in no way do they reflect Cloud b. Any product claim, statistic, quote or other representation about a product or service should be verified with the manufacturer, company, provider or party in question. Perfect for my youngest who is just getting to the scared of the dark stage! I would give this to my nephew. He would adore Charley. I would give this to my cousins little girl. I would give this to my 2 year old daughter. What a great product, thanks for this opportunity! I’d give Charley to my daughter. She has a nightlight and we keep the hall light on but she’s still scared of the dark. A bonus, she totally loves Rapunzel and her sidekick chameleon Pascal, so she’d be over the moon with Charley! I’d love to win it for my daughter. I would give this to my son. He’s begun to complain that shadows are scary, and that he’s so scared! Heartbreaking! I would give this to my 3 year old daughter. She has night lights and princess projections on her ceiling, but she is still afraid. I’m hopeful Charley would help her. My daughter loves stuffies and her bed is also packed but she can’t sleep without them. I would love to give Charlie the Chameleon to my 1 1/2 year old grandson, Oliver. I believe it will help him settle down, and give him the quiet time he needs at night, after his busy day. I would give this to my son, turning 2 soon and starting to wake up in the night getting scared. This is very cute! I would give this to my daughter if I were so lucky to win! I have never heard of this little guy. Going to get one for Christmas. Hoping to win it. My 5 year old needs it. So this would be a great solution! I would give this little guy to my niece. She’s in bad need of a night light and she loooooves stuffed things. I would give this to my boys. They would really like him. Thanks for the chance to win. This looks so cute! It would be a great addition under our Christmas tree for our son who is also reaching that age where he is becoming nervous of the dark. Thank you so much for the chance to win! I would love to win this for my daughter who would be transitioning from crib to toddler bed very soon. My 5 year old is asking Santa for another one of these as hers stopped working. I’d give this to my little cousins if I won. Would love to get this for my daughter! My 8 month old son would love this! my niece Isabella will love this ..
I’d love to give this to my little girl! If I won I’d give this to my one-year-old niece, Rowan. I would give this to my god-daughter! I would give this to my nephew’s little girl. I would give Charley to my son if I won it. I would gift this guy to my grandson, he would love getting this!! This would go to my wee nephew! I would gift it to my granddaughter. I’d give this to my son. It would be perfect for him now that he’s moved into his own room. I would give this to my nephew who would love it. My little guy would love this. I would love to win this for my neice. For my son! He loves toys like this! My little bean would get this so her other stuffies will have a new friend. I would definitely give this to my little boy, it’s so cute! I would give this to my nephew if I won it, so cute! My first & only grandchild, Isabelle, just turned 1yrs, she would love Charley! My 18 month old would really like this. I’d give it to my youngest! My kiddies would love this!! If I won this little guy, I would give him to my 4 year old who is suddenly afraid of the dark and going to sleep on his own. This would be for my youngest daughter. I would give it to my daughter who is going through the being afraid of the dark stage. I would really love to give this to my youngest daughter, Ella. My 8 month old would love this for years ❤ I would definitely give it to her!! My tot would love this. I may even be able to get some stuffies out of his crib too! I think this little guy would be gifted to my nephew! I would give this to my son. He’s turning one next month! I would give this to my daughter. She always brings a flash light and stuffies to bed so this would be absolutely perfect! I would give this to my son, hes always asking for more night lights so this little guy would be perfect! My best friend is expecting her first child in a few months. I think Declan would love this! My daughters would love this!!!! I would keep this in my room as one of the kids eventually ends up in my bed at night. I would give it my niece. I would give it to my daughter! 🙂 thank you. I think my 3 ‘month old would love Charley! This is amazing!! If I won I would be giving it to my son in hopes he would love to going to bed. This would be perfect for my daughter. She sleeps with ‘security’ teddies. I also love cloudB products!